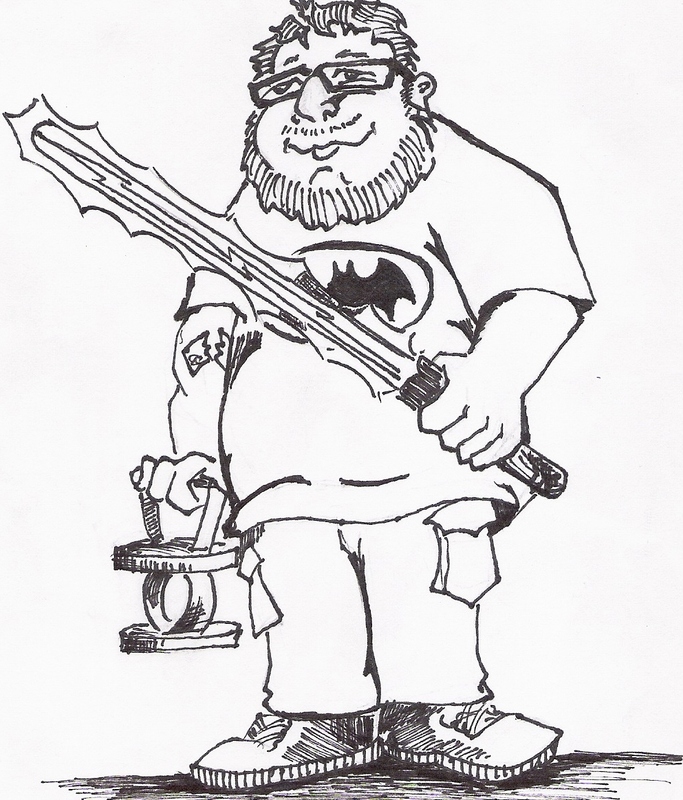 An artist’s rendering of the illusive Greg Hayhurst. Current Nerd Obsessions: Star Wars (dare I say even the prequels, although they aren’t any good. The worst Star Wars film will always beat the best Twilight movie, if there is such a thing), Doctor Who, Batman (comics and movies), Futurama, The Walking Dead (comics and TV show), The Tick, Tom Hardy’s Bane, Blackest Night, Swamp Thing (in every incarnation). I suppose this is the part where I tell my origin story, right? Well, some of you probably already know my story. I was a pretty typical kid, a bit smarter than some of the others my age, but no Adrian Veidt. Fairly unastounding childhood. I grew up in a no-name West Virginia town between a small horse farm and a butcher shop. That covers the first seven years of life, trust me. But a marvelous thing happened the summer of 1995. The Creator decided to re-release Star Wars on VHS. As you know, this is the set colloquially referred to as the “Faces” box set. It was basically the last release of the true, unchanged trilogy to this day. I wanted to watch them immediately. I was hooked. I couldn’t get enough of Luke Skywalker and Han Solo and the droids. I definitely couldn’t get enough Princess Leia. I may have only been 7, but she made a man out of me when Jabba forced her into that iconic, revealing gold bikini. As the saying goes, it’s all been downhill from there. Fast forward to now: I’m sitting in my house, typing on a laptop loaded with ThinkGeek and local comic book store stickers. I’m hunched over the keyboard, complete with Superman boxers and Futurama shirt. To my right, the end table has a small Lego Bat Ski, an absurdly large DC Direct: Knightfall Bane action figure, and a Tusken Raider whose scale falls somewhere in between the two. To my right sits my long box filled to the brim with comics that range from the top-selling titles of DC, Marvel and Image to single issue runs from no-name publishers like Adhesive Comics and The Comics Journal. I’ll have to shell out for another long box in the next couple of weeks. Mind you, I’m not trying to brag. I just love the lifestyle.